It’s hard to take time out for Nature breaks on a regular basis, and even though I try it’s nearly not enough. So, just as an addendum to yesterday’s post, I wanted to share the haven I’ve created in my workplace — every time I’m stressing out over some deadline or grappling with writer’s block, I take a deep breath and look at my little garden. Makes me feel like Alice in Wonderland. Or Virginia Woolf. The words come pouring out. Sanity returns. And all is well in the world again. The little voice still nagging at me in the back of my head — telling me this is not real. It is my reality in those moments. I place myself in this virtual world, surrounded by the things I love, the sights that nurture me, greenery that nourishes me, silence that inspires me. There are no intertubal connections — it’s not the kind of alternate reality we’ve all become used to. This is my Second Life — complete with an avatar. Even as disembodied as it is, it’s tangible. A miniature representation of my ideal situation. A projection of my inner-most desires. Coalescing in my head. A free spirit breaking through. The sky engulfed me. So did the greenery. It was a meditative state … hearing nothing but the chirping of the birds. The sound of the breeze in the rustling leaves. As I cocked my head to the left, I saw the freeway … glistening metal and glass edifices. A mass of civilization. People running from Point A to Point B. Mindlessly. Trying to make ends meet. Trying to figure out their purpose in life through their work. Trying to survive in a consumerist battlefield. Perched up on the green folds of the mountain, I tried to blur it out. All needs, wants, ambition, goals — vanished. It was so real, that it felt surreal. And then came a flood of questions. Why didn’t I make more time for such escapes from a life that continued to stress me? Why have I built a life that continually demands me to be a robot? Why can I not just leave it all behind? Why can’t I enjoy more time with Nature? Why can’t I just spend days wandering, reflecting, marveling? Why do I need a routine, a structure to make sense of my existence? I didn’t come back with any answers, but the questions keep nagging at me. Is it a false sense of security? I don’t want to go down the “I don’t know” street…it never leads me to any answers, just buys me more time to muster up the courage and ultimately confront my fears. I want to close some doors and not look back. I want to open some doors and explore with wild abandon. One day soon we’ll have to sit and talk it through. I, me, and myself on a journey of self-discovery. Also posted on Writers Rising. For the first time in the eight years that I have been in the States, I had an amazing cultural and culinary adventure. Korean signs adorned the place and the patrons seemed like they knew what they were doing. Chopsticks in hand, conversing in their language, ordering what seemed like lots and lots of food. Little plates, big bowls. I, on the other hand, was asking for a fork. As my coworker explained the various dishes on the menu (the photos and part-English descriptions helped), I couldn’t help but be fascinated by the array of choices presented to a vegetarian. 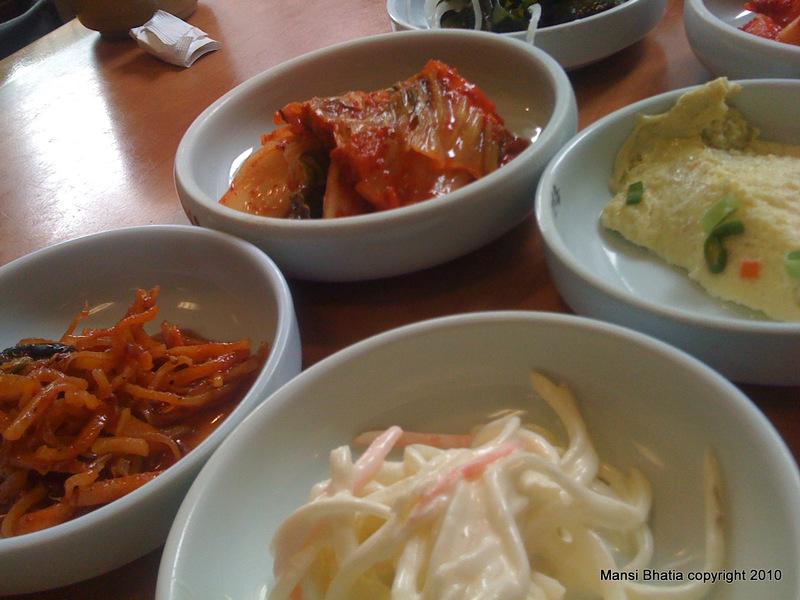 I had many assumptions about Korean food — the biggest one being that they don’t eat anything but meat — that were dissipated today. 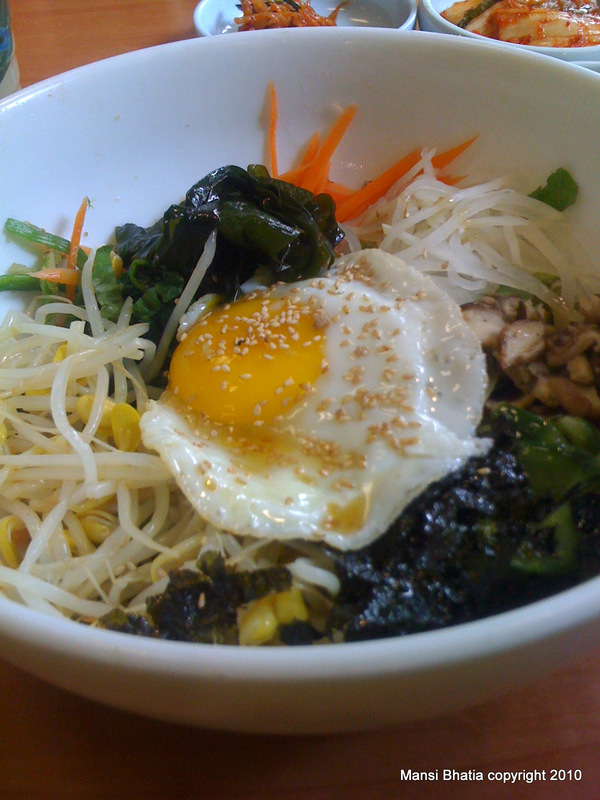 I ordered the Bi Bim Bab — a mixed rice dish presented in a huge bowl with rice on the side. 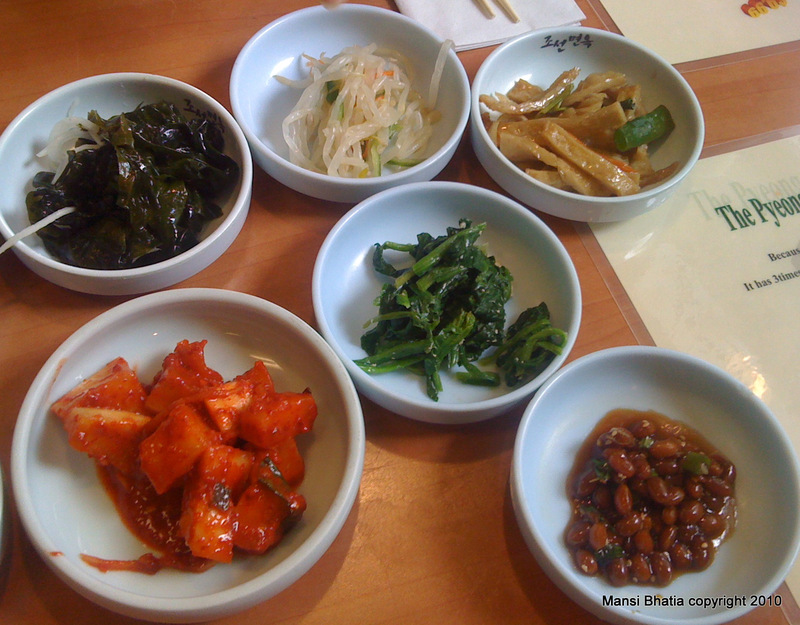 But before that arrived in a huge white bowl, came an assortment of “relishes.” Ah! Those little plates. For those of Indian descent reading this, the closest description I have is that of the condiment container you’d find at North Indian restaurants that carries onions, pickle, lemon wedges, and chutney — things that add a zing to your food! Then came the main dish itself. A big bowl. 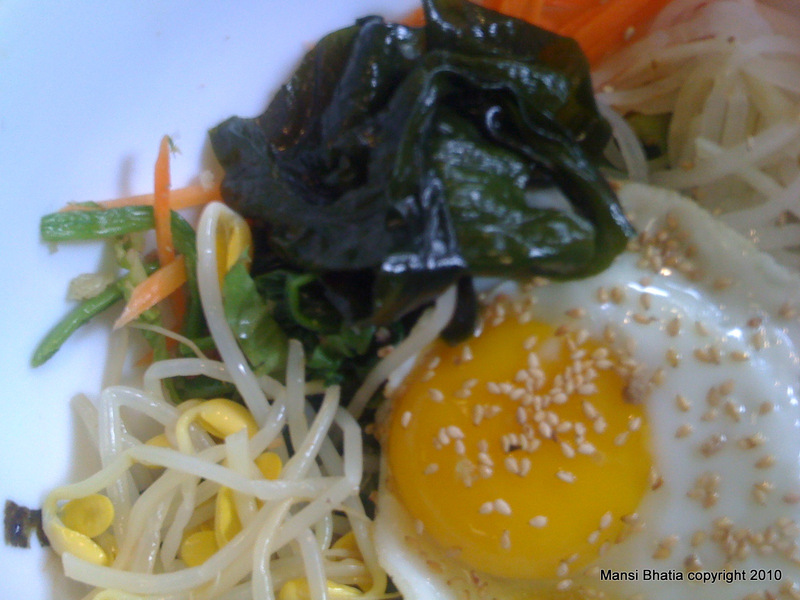 A colorful assortment of raw veggies with steamed white rice on the side. It was a visual treat. And a dash of hot chilli sauce and some vinegar coupled with radish kimchi — it was a burst of different flavors coming together in perfect unison — pungent, sour, spicy, crispy, mushy, and delicious. 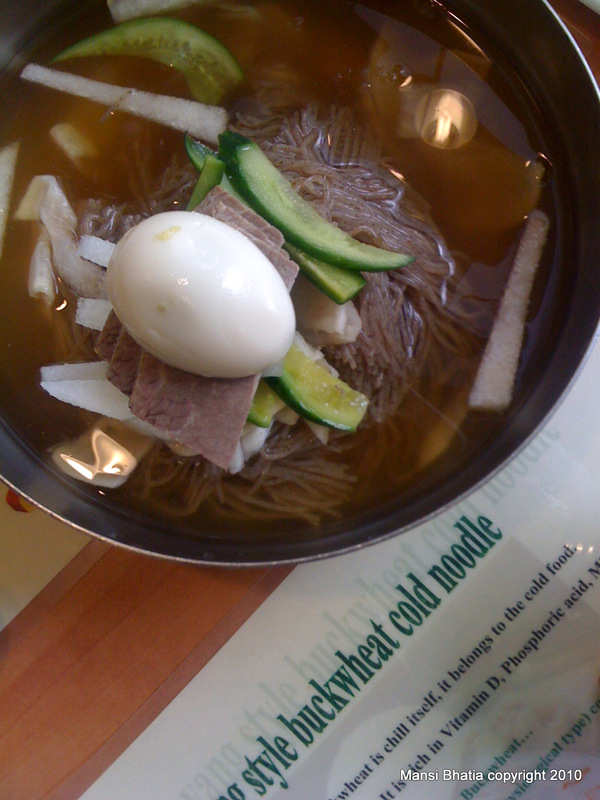 My coworker had ordered a cold soup — chilled broth with buckwheat noodles, beef and veggies topped with a boiled egg. I’ve had Thai, Sushi, Mexican, Italian, Ethiopian, Chinese, French, Greek, and Vietnamese food before, but never visited a restaurant with a person from the country whose food I was relishing. It’s a great experience going by myself — but it’s more guesswork than anything else. More hits than misses, yes, but one doesn’t get the cultural advantage that comes with accompanying someone who knows “their” food. The tables were reversed today. I could see with new eyes what it meant to be on the other side of the cultural fence. It’s hard to explain to someone what golgappas are or what paapdi-chaat is. Or to describe the recipe for rasmalais. At times I’ve balked at having to explain how “we” eat “our” curry. But today, I could understand where those questions come from. And why those simple answers seem so revealing. I realized how lucky I am to live in an area where one can experience world cuisine in a matter of 20 square miles. And with food, comes culture. Tradition. History. The life of a people. Their emotions. Their journey. When we break bread together, we’re put together the pieces of a puzzle so old — each piece unique, complete in and of itself. And yet, stories when shared, so similar to each other’s. I’ve been told some of these issues don’t concern them (or me, for that matter) and never will … so why bother? Why spend time trying to tackle issues that will never arise? Why not just let things be? Why ruffle feathers? Why advocate for change when this is what it is? Why not just “enjoy life” and “take it easy”? Why do I look for answers where there are none? Why do I keep pushing people out of their comfort zones? 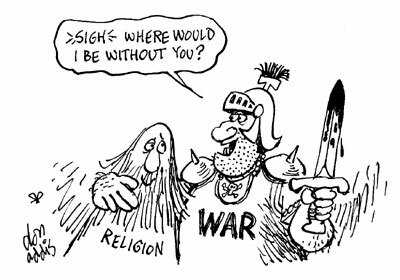 Why do I espouse debate? They tell me to lighten up. To act my age. To have some fun in life. I ask them: Why not just stop thinking all together? What is the point of getting an education that stresses on using one’s critical thinking skills if you’re not willing to use them? Actually, what’s the point of education, even? Why not just go with the flow, stop asking questions, and propagate the status quo? Complacency is so easy. So is conformity. But is that all we want of our lives? That which is convenient? Even if we don’t really believe in social stereotypes, just shut up and assimilate? Because it is what it is? I ask questions because I have a thinking mind. I wonder, I fear, I suspect, I marvel, I doubt. I seek to be a better person. I hope to be the source of some improvement, no matter how miniscule. I don’t think everything is right the way it is. And I think we dwell so much on insignificant things that those that really matter get sidestepped. Those of you who read these blog posts and tell me to enjoy life: you are a privileged lot. You have the mental faculties, the education, and the opportunity to make a real difference in the lives of those who don’t. So, to you I say, grow up. I use my writing to probe. To analyze. To connect with a larger audience. I am not about to squander it for posting trivia. I am not here to entertain. I am here to start a dialogue — even if it is with yourself. I am here to express my appreciation of this life and the world we live in. I am here to comment on the beauty and the ugliness of it all. I am here to be honest. I am not sober and thoughtful all the time. I know how to have fun. But I cannot live the obsequious life. Or the smug life. This blog is a reflection of who I am — it is a tapestry of many different emotions. It’s like a car ride through different terrains. We’ll admire the natural beauty, honk through the urban setup, and even stop for ice cream along the way, but the journey is going to be bumpy and uncomfortable at times. Hop on if you’d like to stretch those mental muscles. 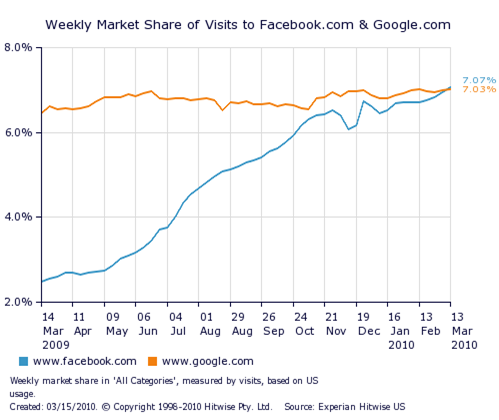 Facebook is more popular than Google. At least it was in the week ending March 13. Even though it was a miniscule 0.4 percent increase over visits to the Internet search giant, it got a lot of tongues wagging. From being a platform where people raise virtual animals and open up their lives, Facebook is fast becoming a forum to get personal recommendations. A handful of my friends have connected their TripAdvisor and Yelp profiles to Facebook making their hotel stays and restaurant reviews available to their network. But most people I know are using their status updates to publish queries, especially when making travel plans. Going to the Grand Canyon area — any recommendations on where to stay? Visiting Idaho — what are some cool things to do besides visiting boh-ring lava fields ? Is in Honolulu — where to get the best mai tais? Instead of “googling” this information and relying on the collective wisdom of random strangers, these folks are tapping into their network — which, if it consists of friends and family with shared interests, would make it an unbeatable resource. A goldmine of viable ideas. The real value lies in getting suggestions from people you know. More important: these are people who know you and your interests. You could be off to the theater district, eating the best local fare, and hanging out with surfer dudes if you ask the right folks. But be careful before you announce your plans on any social media network — if you really don’t want to reconnect with your former high school sweetheart in person (even though you “friended” her on Facebook because it was oh-so-harmless), make sure she isn’t on the list of people with access to your status updates. Always follow the mantra: think before you post. And create lists with variable access. You could have one called “Close friends” who have access to everything — photos, notes, status updates, your wall. Another one called “Acquaintances” for people who can’t see your bikini shots but can read your status updates. A third called “Colleagues,” who have access to your wall but nothing else. And so on. There are ways to tap into the potential of social networking while still maintaining your privacy. Use it wisely. How do you use Facebook? Do you see it becoming your personal recommendation engine?